Looking for the best gifts for outdoor lovers? Whether you’re searching for Christmas, a birthday, holiday, graduation, or another special occasion, this list of 25 gifts will hopefully spark some ideas for your nature-loving friend or family member! I definitely don’t want to promote the idea of buying stuff just for the sake of buying something, so I’ve done my best to curate a list of high-quality gift ideas to save you time. While I haven’t used all of these personally, they’re all items I’d be proud to give or happy to receive (and many are from companies with positive social impact!). Keep reading for 25 gifts for outdoor adventurers, nature lovers, and travelers! Games – Aside from sitting around the campfire, one of the best ways to pass time on a camping trip is playing games! As a kid, my favorites were Skipbo, UNO, and Phase 10. I still love those ones but have added a couple more to the rotation: Settlers of Catan (slow and strategic) and Dutch Blitz (fast-paced). Kusa Blanket – This blanket from Cotopaxi is a high-quality investment that will last for many years of adventuring! The lightweight option is perfect for summer evenings, while the Kusa 160 provides an extra bit of warmth. Camp chairs – Nothing beats sitting around the campfire at night in a camp chair, and these chairs let you get extra comfy for all your s’more-making and beverage-of-choice-drinking. Libre Socks – These aren’t the kind of socks your friend or family member will roll their eyes at. Breathable, moisture-wicking, and supportive, Cotopaxi’s colorful Libre socks are great for everyday adventures. Plus, they’re made of llama fiber, so what’s not to love? Batac Day Pack – I’ve been using this 16-liter pack from Cotopaxi for about a year now and have found it to be a great size for day hikes (from short trips to hiking a volcano in Guatemala to my camping shower bag). Plus, it’s from Cotopaxi’s Del Día line, which means they use scrap material (so there’s less waste out there in the world) and let factory employees design each one for a one-of-a-kind colorful backpack. Fanny Pack – Want something smaller than a day pack to carry a few small essentials while hiking, biking, or outdoor adventuring? While some of us 🙋 can’t pull this off, if your friend can rock a fanny pack, this one–also from Cotopaxi’s Del Día line–is perfect for a pop of color. Percolator or Aeropress – It’s definitely not a camping morning without a good cup of coffee, so coffee making tools are essential for people who love camping. We’ve been using a percolator for a couple years on camping trips with friends, but we haven’t quite mastered the not-getting-grounds-in-our-coffee technique. This year we used an Aeropress and it was pretty perfect. Thermos – The Stanley vacuum thermos is classic (it’s been around for 100+ years! )–I remember my dad taking soup to work in this when I was a kid. Long-lasting and versatile, this is a great reusable container that keeps hot food piping hot all day. Plus, it comes with a lifetime warranty. 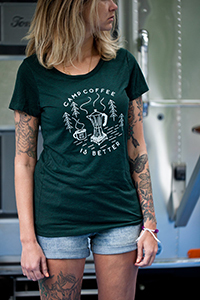 Camp mug – What’s camp coffee without a great camp mug? I love these llama mugs from Cotopaxi, made of stainless steel and with the classic speckled look. Perfect additions to your outdoorsy friend’s camping supply bin! “The Mountains Are Calling” mug – For your mountain-loving friend, this camp (or everyday) mug is perfect. Plus, for every product you purchase from United By Blue, they remove one pound of trash from oceans and waterways. “Take Me to the River” mug – Your paddling friends will love this copper mug–great for cocktails at the cabin or cold drinks on a summer camping trip. Or check out the rest of United by Blue’s copper drink ware here. A water purifier (not just a filter) is an ideal gift idea for outdoorsy people and frequent travelers. I’ve used a Grayl bottle for a few trips now and am happy with how it works. Another option is Steripen (for use with a separate water bottle). Camelbak – These hydration packs are great for carrying more water that’s easily accessible on the go, whether for hiking or cycling. REI carries quite a few styles and color options (including smaller packs for kids!). Good To-Go Meals – While the term dehydrated meal sounds decidedly unappetizing, these meal packs for backpackers and campers were created by a chef to actually taste good. They get bonus points from me since they’re made in my home state of Maine, but your outdoorsy friend might just love them because of the clean ingredients and creative flavors–everything from Pad Thai to New England Corn Chowdah. Plus, they are gluten-free and have vegan options! 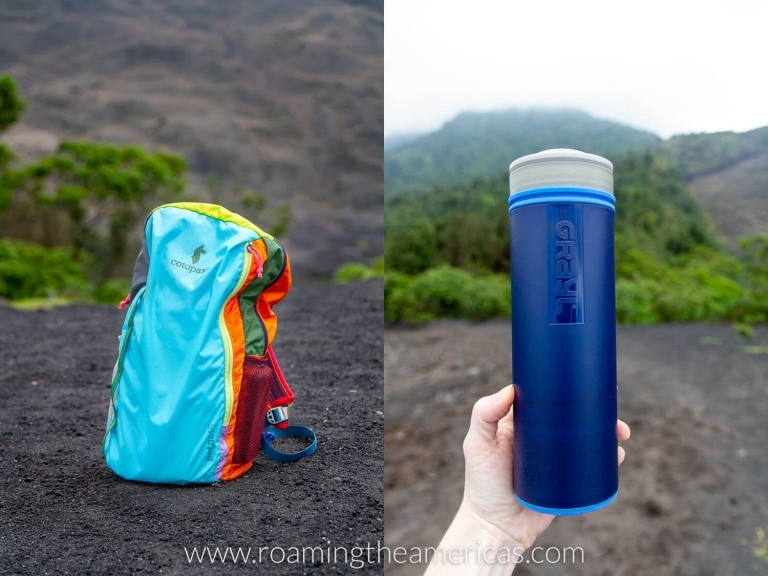 The Cotopaxi Batac 16L backpack and Grayl water purifier out in the wild on a volcano hike in Guatemala! Wilderness Essays by John Muir – For those times your outdoor adventure-loving friend is stuck indoors, this book of essays is the perfect escape. It includes some of John Muir’s classic essays about wild places in the western United States. Canoeing in the Wilderness by Henry David Thoreau – Travel with naturalist Thoreau on his famous 1857 trip through Maine’s woods and waterways with a Penobscot guide. Get more Maine-themed gift ideas here! Bushcraft 101: A Field Guide to the Art of Wilderness Survival by Dave Canterbury – Learn all the basics and essential survival skills in this thorough resource for outdoor enthusiasts and nature lovers. National Parks Guide – This Moon USA national parks guide provides details and tips on all 59 national parks in the United States. If your outdoor-loving friend doesn’t already have a road trip in their 2019 travel plans, this might inspire one! Give the gift of travel and pair this book with a one-year National Parks Pass. Subscription to Backpacker – Magazine subscriptions make affordable gifts that keep giving all year long. Backpacker is a great magazine for campers, backpackers, and other outdoor adventurers. Remember that the first issue takes awhile to arrive, so you might want to pick up the latest issue to give with your initial gift. Traveler Journal – This lined journal (100% recycled paper) has a linen cover and simple pine tree + compass design–perfect for outdoor travel adventures! Plus, for every product you purchase from United By Blue, they remove one pound of trash from oceans and waterways. America the Beautiful National Parks Pass – Got a road tripping or travel-loving friend? The National Parks Pass covers admission to sites managed by the Forest Service, National Park Service, Fish and Wildlife Service, Bureau of Land Management and Bureau of Reclamation. Good for one full year from the month of purchase. Plus, when you purchase here in 2018, REI will donate 10% of proceeds to the National Park Foundation. GoPro Hero Camera – This super portable, waterproof action camera makes a killer gift for outdoor adventurers. A slightly older version may be sufficient (and more affordable) for many enthusiasts, but consider this model for the latest and top of the line features for avid photographers and videographers. Garmin inReach Mini – For all the moms worried about their kids venturing into the deep wilderness with no cell signal, this small and rugged satellite radio is the perfect gift. With a satellite subscription, the user can trigger an SOS emergency signal via satellite, in addition to being able to send and receive text messages, access maps, and get the weather forecast–all in a super compact and lightweight package. Got any more outdoorsy gift ideas you’d add to this list? Let me know in the comments below!